Sometimes regular players who haven’t won a significant amount in the lottery just get into the habit of buying tickets without ever expecting to win. And then they get really surprised when they hit the big one. Violet Grahamslaw, a pensioner and keen knitter, had been playing the lottery every week since it started in 1994. In the process, bunches of tickets would sometimes accumulate unchecked. Good for her that husband John decided to take the neglected tickets to an outlet to have them checked. 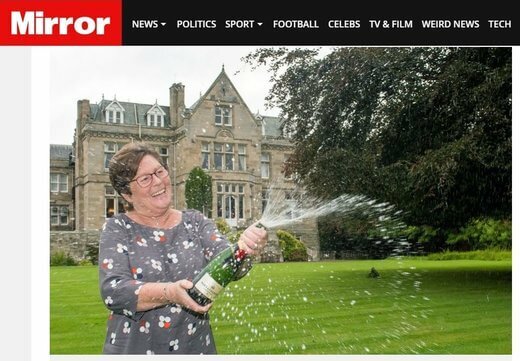 They were surprised by a £1 million prize when one of the tickets had a code that matched the one drawn. She immediately called her mom to tell her the good news. The first thing that came to her mind was buying a new sewing machine. Home improvements starting with a new kitchen, a living room upgrade, and maybe updating other rooms too are also planned. The winner also plans to take the whole family on vacation.